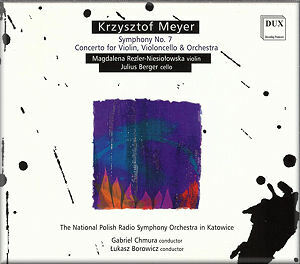 If there’s one thing I have to thank MusicWeb International for, apart from the lovely people who write for it and run it, who are a sheer delight to work with, it’s the fact that I’ve been sent several CDs of music by Krzysztof Meyer to review. In Meyer I have found a truly worthwhile contemporary composer. Here’s a figure who can orchestrate brilliantly, can create tunes and long-breathed themes, knows what to do with them and how to work out his argument to a satisfactory conclusion. He’s not afraid to show his emotions and, best of all, Meyer is a composer who can easily communicate despite using a fairly modern language. To put his work in perspective, he’s not as way-out as either the Dane Pelle Gudmundsen–Holmgreen or the Norwegian Olav Anton Thommessen. He is way ahead in matters of immediate communication – more so than Allan Pettersson or even his compatriot Krzysztof Penderecki. His is a unique voice: highly passionate, very dramatic and richly conceived. Here is a Symphony which is a real Symphony, one which, as Mahler said, “must embrace everything”. It certainly does that for this Symphony for the Passing of Time is a big work, playing for nearly 45 minutes, in three movements. Starting with a dark, slow, introduction - gongs, low strings, a theme for the clarinet - the music grows until trumpet calls seem to herald the fact that this music is approaching catastrophe. This is a marvellously built climax, and it is suddenly released in an allegro of great fire and urgency. Thrilling stuff. Imagine Shostakovich or Honegger with plenty of attitude. This is very disturbing music, and it’s not an easy listen but what a world it inhabits! It’s compelling and the never-ending forward thrust is irresistible. A brief moment of respite and the movement ends in unresolved defiance. The middle movement starts with an ostinato on pizzicato basses with a winding theme for flute. The angst returns, there’s a climax and we’re suddenly back in no man’s land with dissonant string harmonies. Thereafter, the music veers between large and small gestures. The finale is resigned, with some rich chordal writing for the strings. Here is real tragedy, filled with heart-felt emotion for the lost. The Symphony ends quietly, fading into nothingness. This is the point at which you must stop the disk for, despite 17 seconds of pure silence, you may need a longer rest before continuing with the music. The Double Concerto is much easier to listen to, although it’s recognizably the same voice as the Symphony. It’s lighter in feel and, obviously, has to make allowances for the virtuosity of the soloists. The first movement starts with a long recitative for the cello alone, which is followed by a duet for the soloists. Then the orchestra brings in the main body of the movement – fast and angular; this is music for discussion. It’s incisive and dynamic, brilliantly orchestrated and superbly laid out for the soloists. The slow movement is in two parts. The first is pure melody, rich and long breathed song from the soloists over a shimmering orchestral accompaniment. Then the orchestra sustains chords whilst the soloists indulge in arabesque colouring. It is very restrained, subdued and intensely beautiful. The finale is all fun and frolics. The performances of both works are excellent. It’s full of life and drama - the players and conductors obviously understanding, and enjoying, every minute of the music. The sound is bright and clear with a nice balance between soloists and orchestra in the Concerto. This is exciting and wholly satisfying music in an idiom which is easy to assimilate. Whilst being in a modern language it is packed with tunes. Please give Meyer a chance because on the strength of what I have heard of his music he is well worth the effort.